Entrance to the Global Seed Vault, one of the most important buildings on Earth. The vault itself is situated 120 meters (393 feet) deep inside a mountain surrounded by permafrost. It is a long-term seed storage facility, built to stand the test of time and the challenge of natural or man-made disasters. 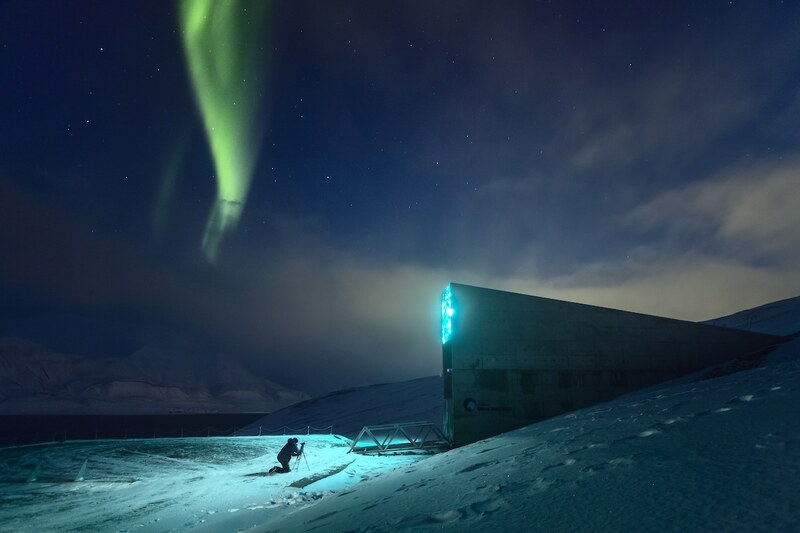 The Seed Vault represents the world’s largest collection of crop diversity; as of 2017 there more than one million seeds stored there. 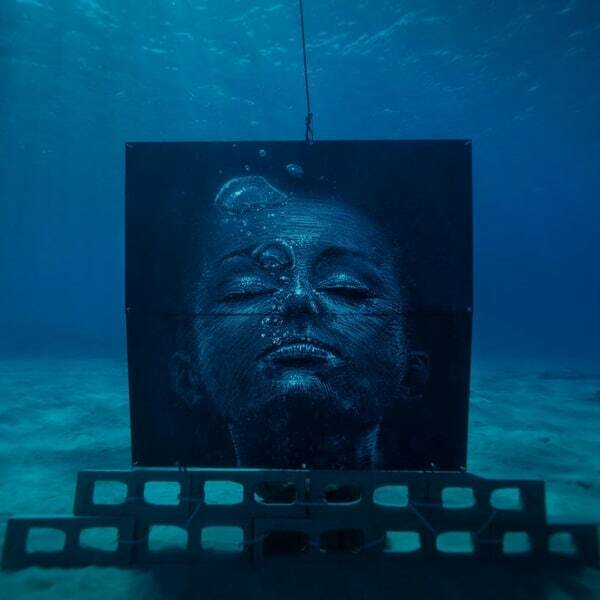 The entrance to the Vault is also an art installation called Perpetual Repercussion. 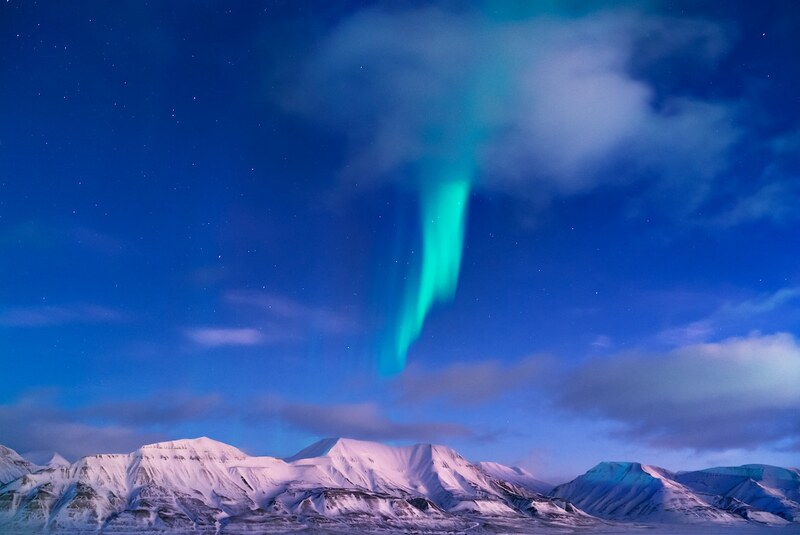 In winter, its muted greenish-turquoise and white lights imitate the Northern Lights. Russian photographer Maria Sahai grew up on the shores of Sea of Okhotsk, and from childhood has been fascinated by the existence of remote villages in the Arctic. Since 2013, Sahai, together with her husband Karim, have spent time in the world’s northernmost settlement, creating a powerful reportage about what it means to live in this remote area of the world. Located just 800 miles (1,300 kilometers) from the North Pole, Longyearbyen is a small mining town that is the administrative center of Norway’s Svalbard Archipelago. Surrounded by the Arctic Ocean, in a land where the sun doesn’t rise for months and the colorful Northern Lights dance across the sky, it’s a settlement surprisingly filled with life. 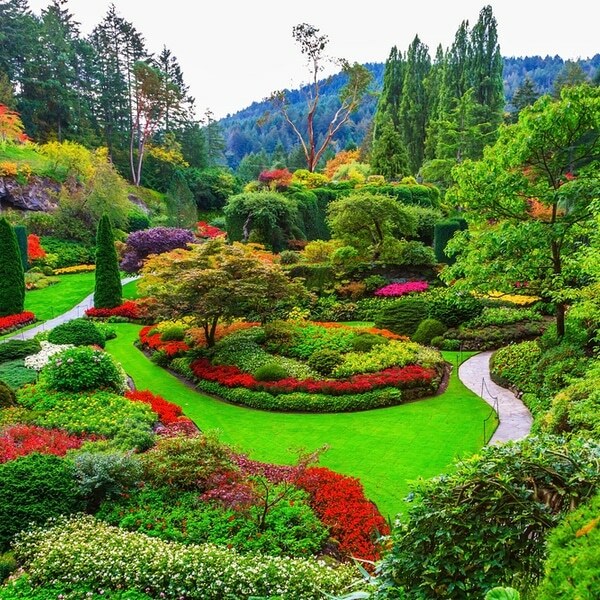 From scientists and doctors to coal miners and artists, the small, close-knit population has created a thriving community to help one another through the harsh conditions of their environment. Sahai’s long-term project is a fascinating reportage that documents life in this remote area, displaying both the beauty of nature, as well as man’s survival in the Arctic. We had a chance to speak with Sahai about what inspired her exploration and what she hopes people learn from this spectacular set of images. Unique daytime Northern Lights. 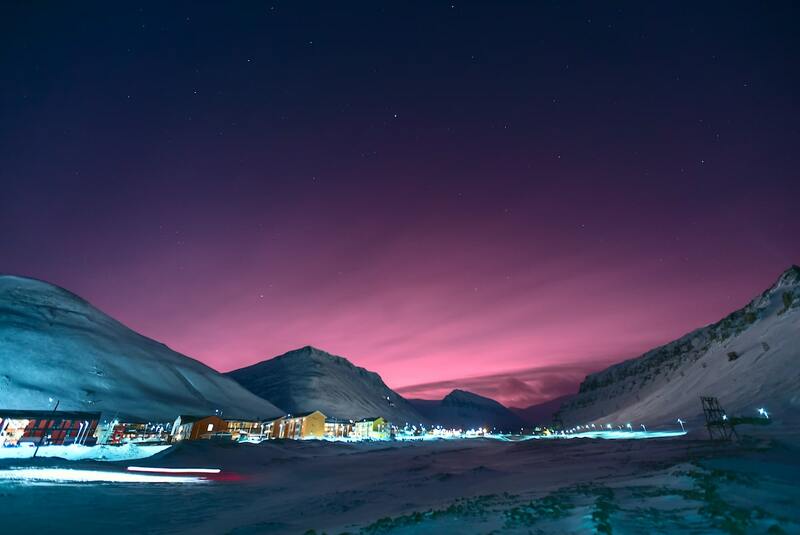 Unlike the majority of places where one can observe the Northern Lights only during nighttime, the skies of Longyearbyen are often illuminated by green, purple and pink even during the day. You mention being attracted to different cultures and far off places for as long as you can remember. Where do you think that desire came from? My family worked in the Soviet military, traveled throughout the Soviet Union, and took many pictures of the places they visited. As a child, I spent a lot of time looking through our family photo albums. They were filled with black and white pictures of the frozen taiga, the deserts of Centr-al Asia, and the windy shores of Caspian Sea. My nighttime stories included legends of Chukchas—the indigenous people of the Russian Far East—and fairy tales of Kazakhstan’s nomadic tribes. Having lived in the Arctic for a while, my mother loved telling stories about how people could not go to work because of huge snowstorms, and how sleeping was hard and thick blankets had to be used to block the brightness of the Northern Lights! Those stories made me forever curious about the world. For as long as I can remember, I dreamt of discovering as many of the less explored places on the planet as possible, and to share those experiences with others. Eventually, I turned to photography as a means to record my own travels and to share my discoveries with family, friends, and everyone. 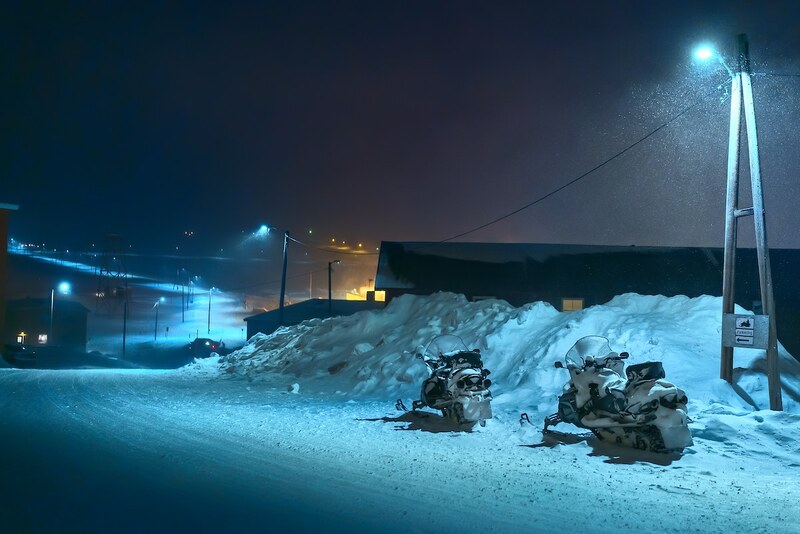 Snowmobiles parked on the streets of Longyearbyen. There are more snowmobiles in Svalbard than people. Snowmobiles cost less there than on the mainland due to lower taxes. The price of petrol is low and most people have a good income. Many put a priority on buying a snowmobile when they come to Svalbard to live for a few years. How did you originally get started with photography? My first real experience with photography was when I was 10. I was given a camera and the responsibility to record the family holiday that year. I was both enthusiastic and very impatient. Hoping to see all my photos, I opened the back of the camera and ruined a roll of film. More than a decade later, I was working as a copywriter in advertising. It was a world of weekend work, long hours, and stress. 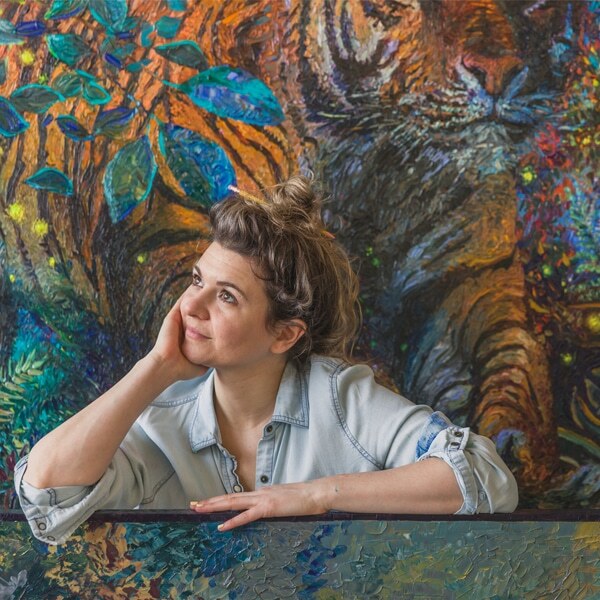 I needed a creative outlet, a personal project, something that could help me switch off. I chose a medium with no words involved: photography. 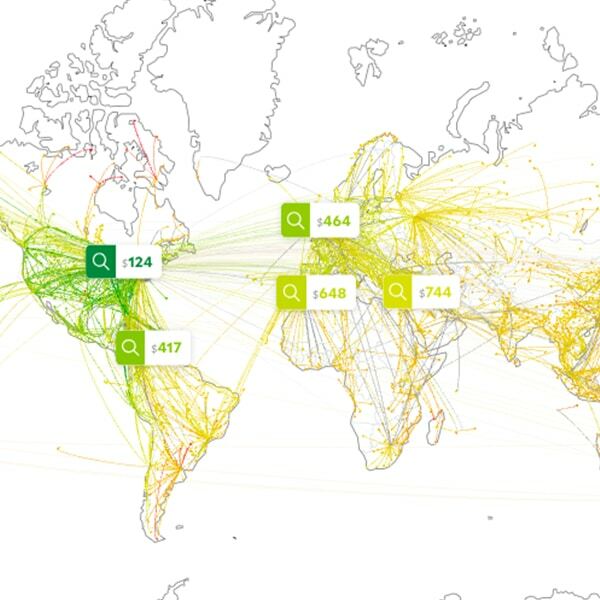 How long have you been traveling to Svalbard and what first attracted you to the area? After hearing and dreaming about the Arctic my whole life, I couldn’t settle for anything less than the world’s northernmost settlement. My husband—who is as fascinated as I am by the Arctic—and I traveled to Svalbard in 2013. It was my first time in Longyearbyen, Svalbard’s main settlement, and an amazing experience overall. Since then, I’ve been going back to Svalbard several times a year. I think the attraction with Svalbard, and the Great North in general, is ingrained in me. In a way, I’m following my family’s footsteps. My mother was particularly interested in traveling as far north as possible. She was attracted by how remote and unexplored the Arctic is. 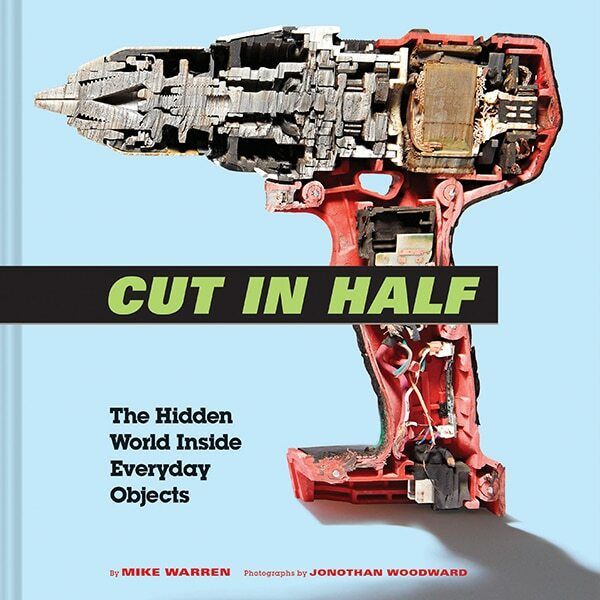 One day in the 1970s our family packed everything and moved to Magadan, a small arctic settlement on the shore of the Arctic Ocean in the Russian Far East, where gold and silver deposits attracted workers from around the USSR. I was born in Magadan and after a while, the family moved to Kazakhstan. 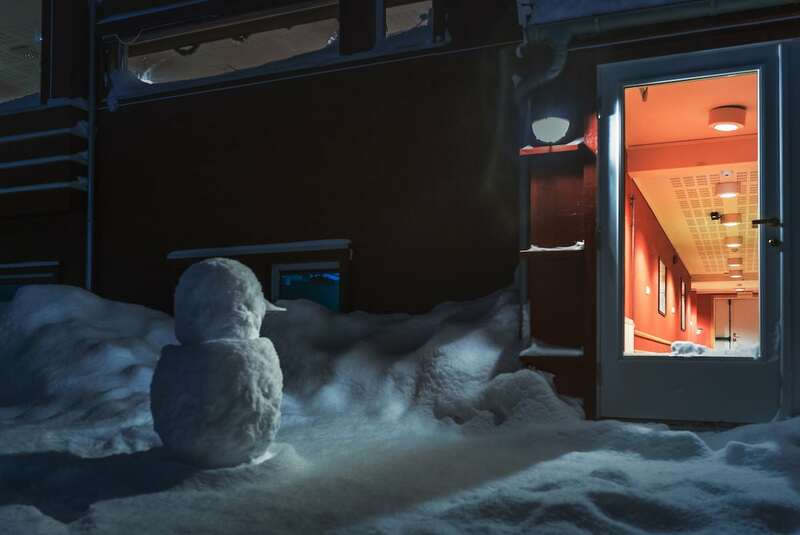 Snowman in Longyearbyen during Christmas time. In such a remote and cold place, there are over 200 kids below the age of 18. During Christmas holidays the streets are full of children running, playing with snowballs or building snowmen. What’s the most surprising thing you’ve learned about the people who live in Longyearbyen after having spent so much time there? By far, I would say it’s the strength of the bond between people, their hardiness, and their deep love for Svalbard. Living in the Arctic isn’t for everyone. 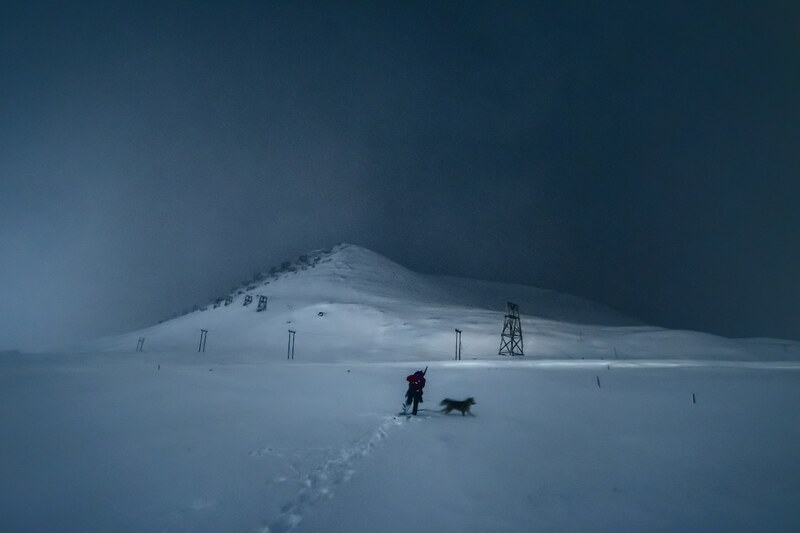 Svalbard is far from everything, the climate is forbidding, and for almost 5 months a year, the sun doesn’t rise. When walking around Longyearbyen you hear people speak Russian, French, German, Norwegian, etc. 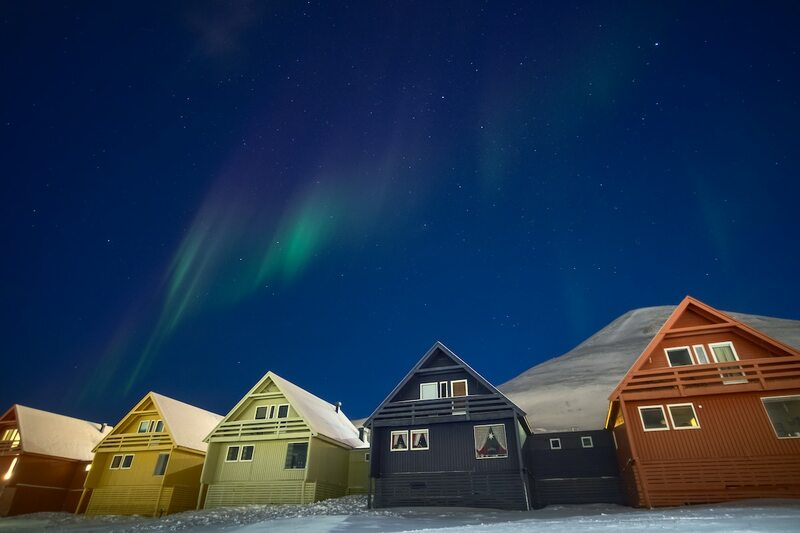 There are more than 40 nationalities living in Longyearbyen and throughout Svalbard. Cultural differences vanish when someone needs help and when everyone gathers on March 8, the daylight from the sun is visible for the first time of the year in Longyearbyen. Where streets have no names. If saying that Longyearbyen is the world’s northernmost settlement is not enough to get you excited, I have a more romantic description. It’s a place where the streets have no names. They are numbered rather than named here. What do you hope people come away with when looking at this series? For many people, the word “Arctic” has a special connotation: cold and desolate. These are only two of the aspects of that part of the world. 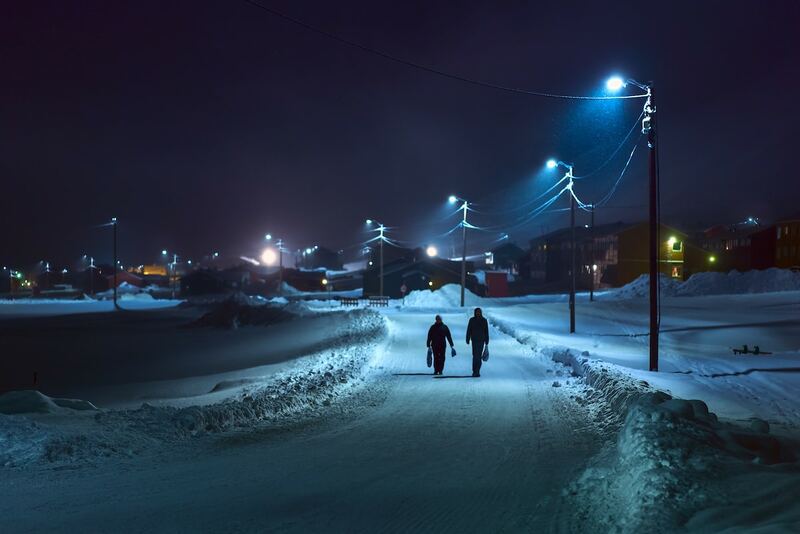 With the photographs in this series, I aim to show other aspects of life in the Arctic. 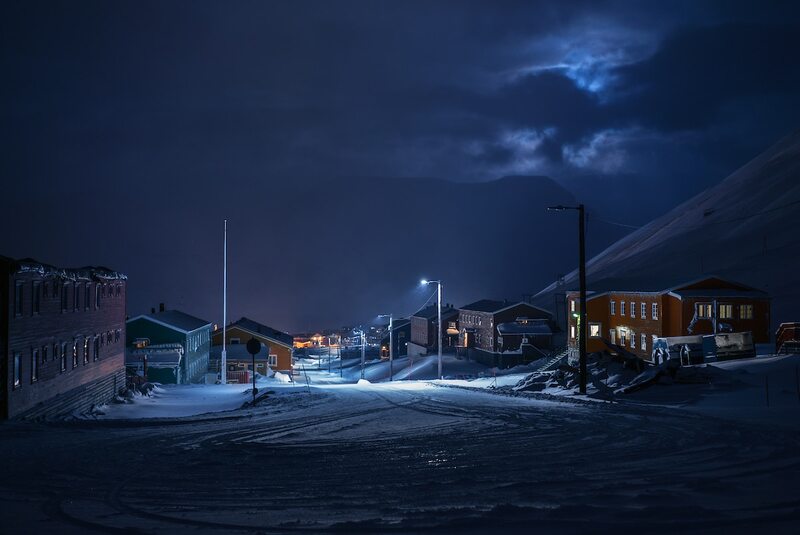 More than a settlement of around 2,000 souls located south of the North Pole, Longyearbyen is home to scientists, chefs, doctors, artists, mushers, students, teachers, coal miners. 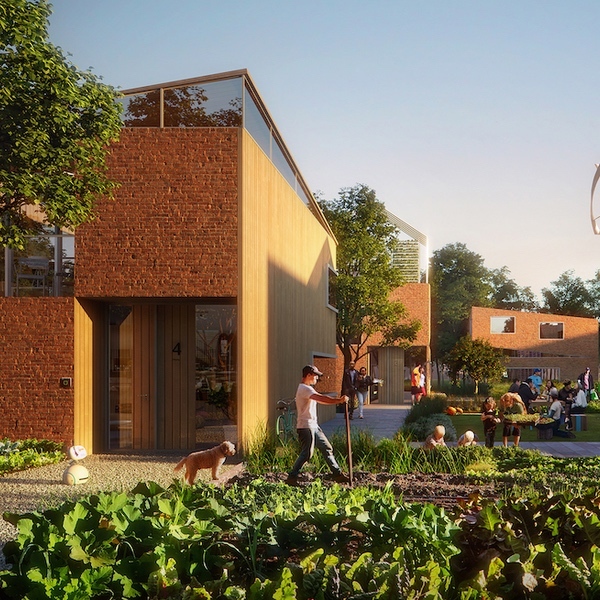 Together they built a beautiful and a welcoming community, where one can both enjoy a glass of wine during world’s northernmost Jazz festival or go on a dog sled expedition for several days and hopefully see polar bears. 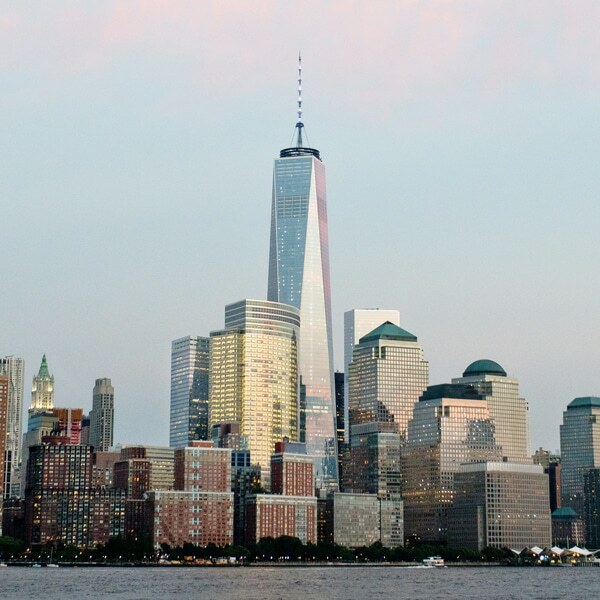 How often do you return and is there anything you’ve been hoping to photograph, but haven’t gotten the chance yet? My husband Karim Sahai is also a photographer, and together we have been bringing our friends and many photography and nature enthusiasts from around the world to Svalbard, between 2 to 4 times a year. One recurring highlight for us is when our guests see Northern Lights or polar bears and other arctic wildlife for the first time. Another exciting moment is when we’re greeted by a pack of super happy and friendly huskies ready to be harnessed for a dog sledding expedition. The Svalbard Treaty signed in 1920 established Norway as the sovereign nation. However, signatory nations were given equal rights to engage in commercial mining in the archipelago. This is why the lesser-known settlement of Barentsburg exists. It’s controlled by Russia and is home to about 350 people who mostly work for a coal mine. There is another abandoned Russian settlement called Pyramiden currently being restored. I’ve visited them before, but I am hoping to explore those areas more in depth soon. My connection with the former Soviet Union and the Russian Arctic is calling! Driving through a heavy snow storm in Svalbard. 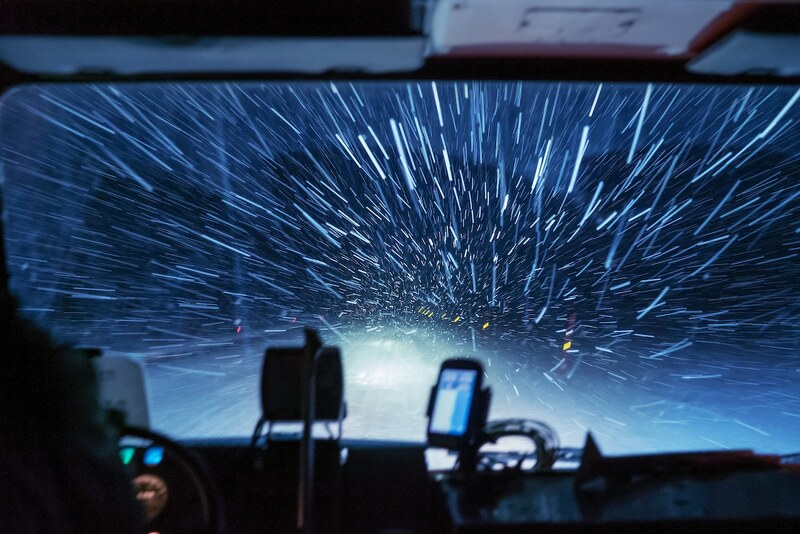 This image is taken from a cabin of a snowcat—a specialized enclosed-cab, truck-sized, fully tracked vehicle designed to move on snow. It is perfect for exploring the wild surroundings of the Archipelago no matter what weather conditions. Do you have a particular favorite photograph from the series? This picture was taken from inside a snowcat, while exploring the valleys around Longyearbyen, during the long and cold polar night months. A snowcat is an all-terrain vehicle with tank treads. It’s perfect for exploring the wild and frozen environment of the archipelago. I think that a simple experience like this one will become rarer in the future. The discussion about climate change is raging. Despite incontrovertible evidence, some deny that human activities are behind the increasingly extreme or unusual climate patterns we’ve been seeing. Those events are felt throughout the Arctic and at lower latitudes. Though I’ve only been going to the Arctic for a relatively short time, climatically speaking, the changes I’m seeing are pretty dramatic. Those who are living there permanently state that something is clearly awry. Glaciers are retreating at an alarming rate. 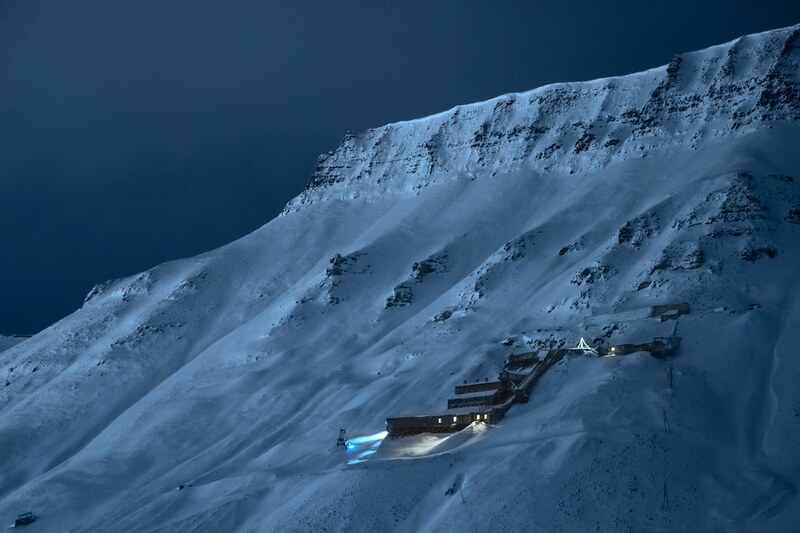 Two years ago, an arctic cyclone brought unprecedented levels of snow to Longyearbyen and caused a deadly avalanche—a first in winter, and for Longyearbyen. In 2017, a month-long rainfall disrupted the whole tourism industry. A few weeks ago, in the middle of what is supposed to be the coldest season, temperatures soared well above freezing point at the geographic North Pole. Christmas lights on in an abandoned coal mine. This mine was in operation from 1913-1964. 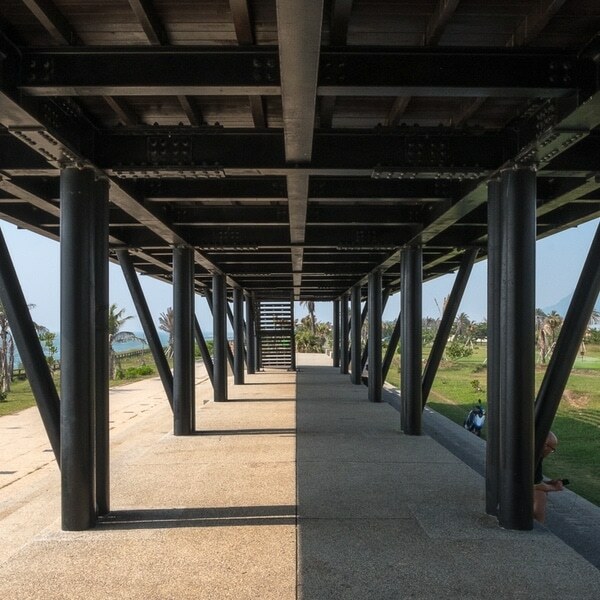 Today, it is a heritage site. 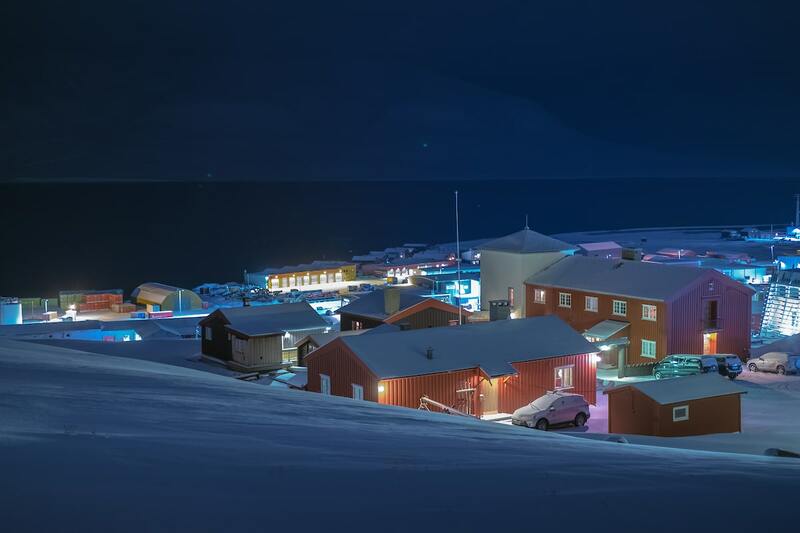 Residents of Longyearbyen call it “Julenissegruva” (The Santa Mine). The children in Longyearbyen are told that Santa resides in this mine, so every Christmas they write their wish list for Santa and put it in a mailbox on the road below the mine. In winter, the bravest tourists climb the mountain to see the mine up close, you can observe some of them on the image above, represented by the blue torch lights below the mine. You lead photography tours to diverse locations around the world, like Rwanda and Greenland. What is your favorite part about leading other photographers on these adventures? Whether they got the perfect shot of a whale’s tail in front of a glistening iceberg in Greenland, or had a magical and intimate moment close to a baby mountain gorilla in a forest in Rwanda, or marveled at the fast-moving Aurora borealis in the incredibly clear and starry skies of Svalbard, for us the best part of every photo tour is seeing the amazement and the joy in the eyes of those who travel with us. In a small way, experiences like this will be shared upon returning home and will help bring awareness to the immense beauty and fragility of our home planet. It is said that there is more happiness in giving than in receiving. I couldn’t agree more. Both Karim and I feel very lucky that we can share our passion with others while exploring some of our planet’s most beautiful and unexplored areas. Northern Lights as seen during a natural phenomenon when the sky turned bright pink. The pink glow was caused by the sunlight being reflected by stratospheric clouds. The position of the clouds between Svalbard and the Scandinavian mainland is the main cause of the red light rays. This phenomenon can be observed on the Archipelago once every few years. We’re working on a couple of personal projects in Greenland and new photography tours in the Russian part of Svalbard. There are areas that have been closed to the general public for decades, but it looks like we will have a chance to photograph some of them this year. Greenhouse by Polar Permaculture in the Arctic Desert. 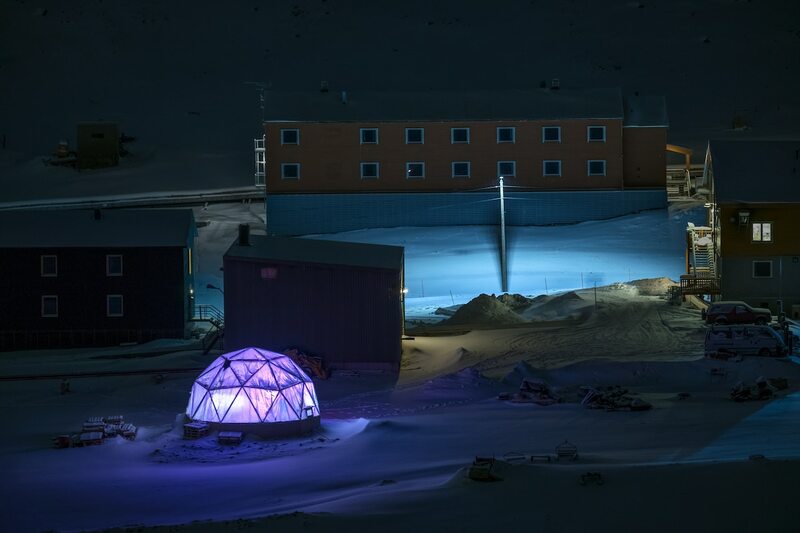 Even though it looks like a modern art installation illuminating the snowy Longyearbyen, it is a fully functioning Greenhouse built by Polar Permaculture project. I believe that in harsh climates people become more creative. And the fact that, when visiting Longyearbyen, you can taste vegetables and crops grown there is a proof of that. 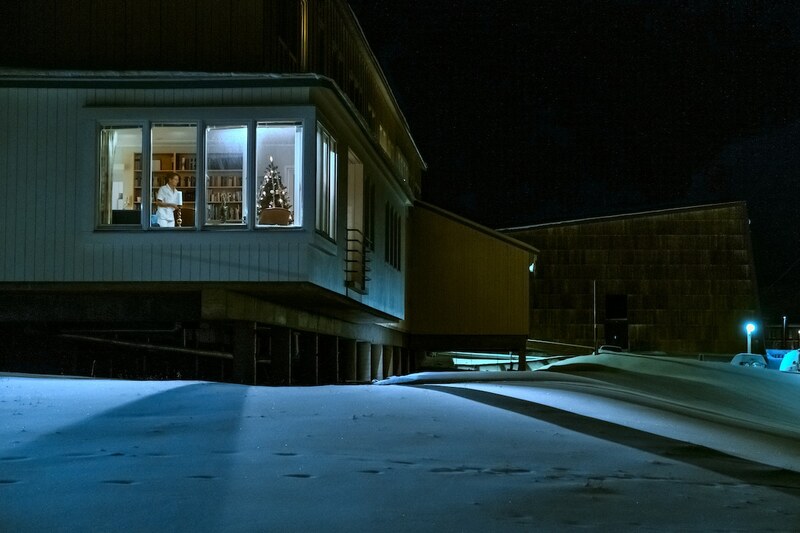 World’s northernmost hospital, only 1300 km (808 miles) away from the North Pole. Another unique law that everyone must obey in Svalbard is no one is allowed to die there. The reason is very simple—permafrost. The soil doesn’t defrost even in summer, which means that burials are impossible. 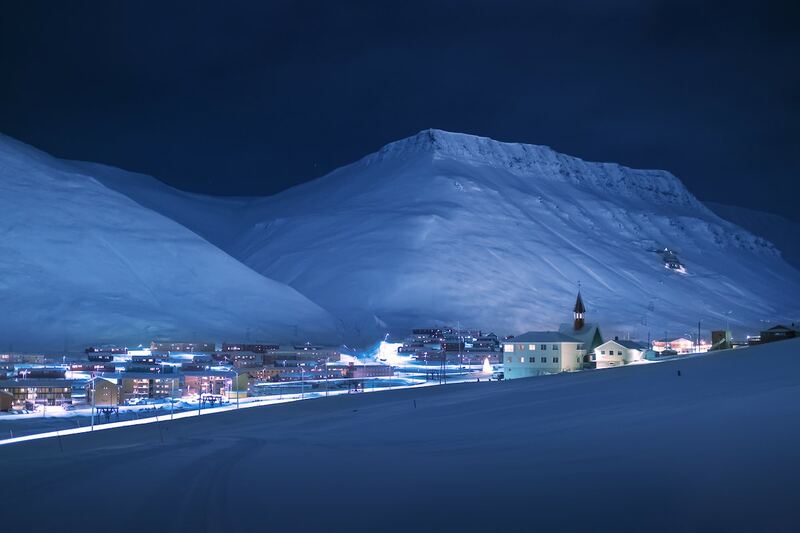 Longyearbyen City lights at night. When there are several months of no sun and a need for year-round heating, a city needs a lot of electricity. Today, Longyearbyen obtains it from its coal power plant, which produces annual emissions of 40 tonnes of CO2 per inhabitant, four times as much as on the mainland. 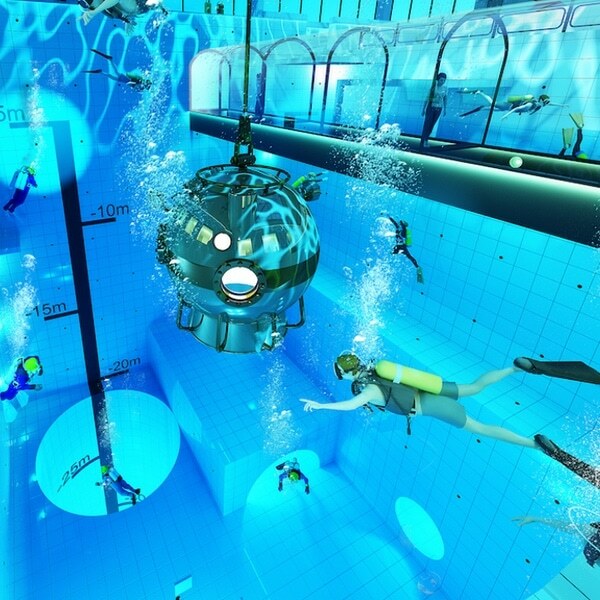 For that reason, there are plans to build a completely green hydrogen-fuelled power station in Svalbard. 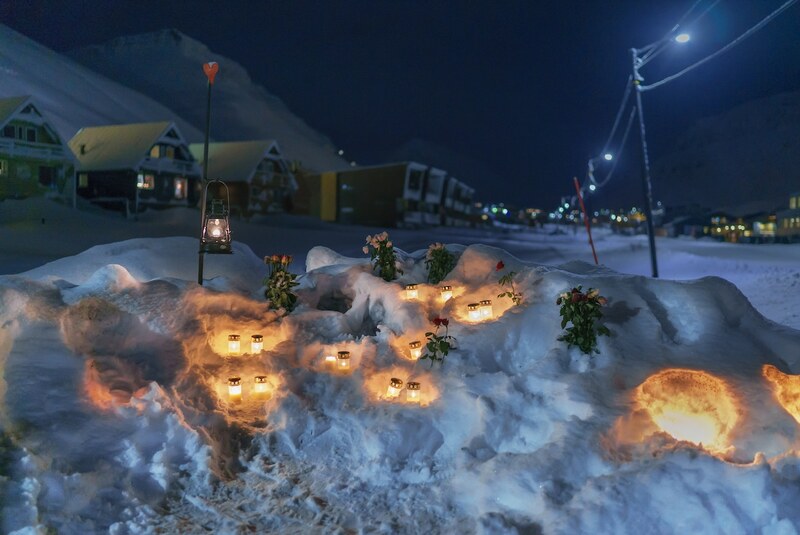 Memorial to the victims of avalanche that happened in Longyearbyen in December 2015. During this tragedy in December 2015, one person has been killed and nine others injured after an avalanche buried about 10 houses. I arrived in Svalbard day after the tragedy and went to pay my respects to the victims. A local with a dog and a rifle. Dogs are the best companions in the Arctic, they can notice a Polar bear way before you and will warn you about it. 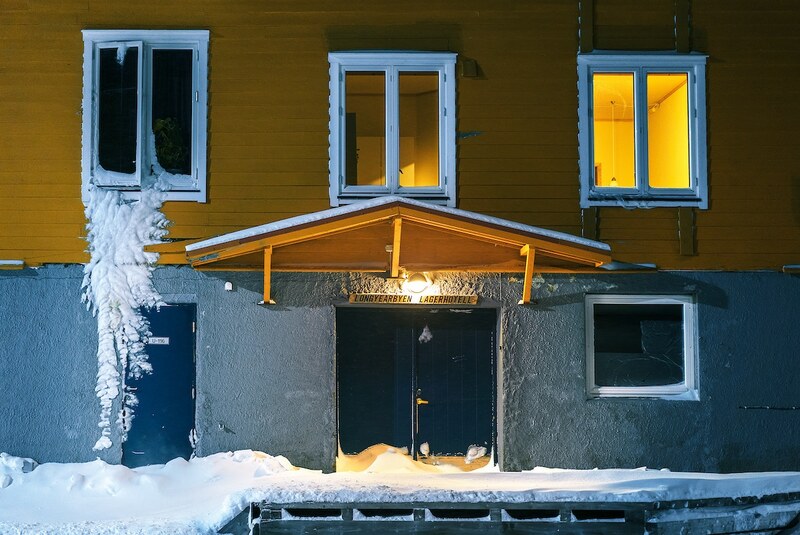 Rule #1 when living in the Arctic—check your windows. The Svalbard archipelago is the meeting place for cold polar air from the north and mild, wet sea air from the south, creating low pressure, changing weather, and fast winds, particularly in winter. In January, when this picture was taken, temperatures are normally between -5 and -20 °C (23 and -4 °F). Svalbard reindeer, the world’s northernmost herbivore mammal. They deserve special attention, as they’re a unique subspecies of reindeers, endemic to Svalbard. They are lighter and shorter than the reindeers on the mainland. 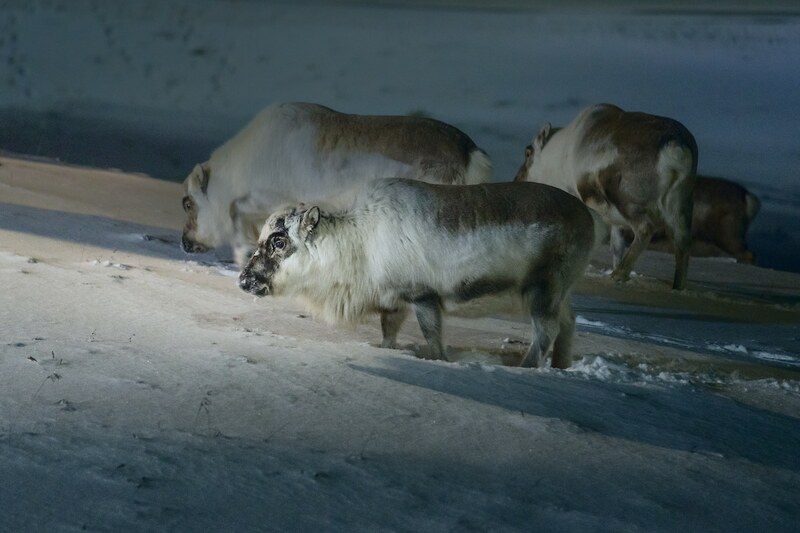 You can often see Svalbard Reindeer roaming the streets of Longyearbyen looking for shrubs under the snow. Inside of an abandoned coal mine. Nowadays, this mine is one huge museum exhibit. On one cold November afternoon in 1996, the miners were told to take their belongings and leave the mine. 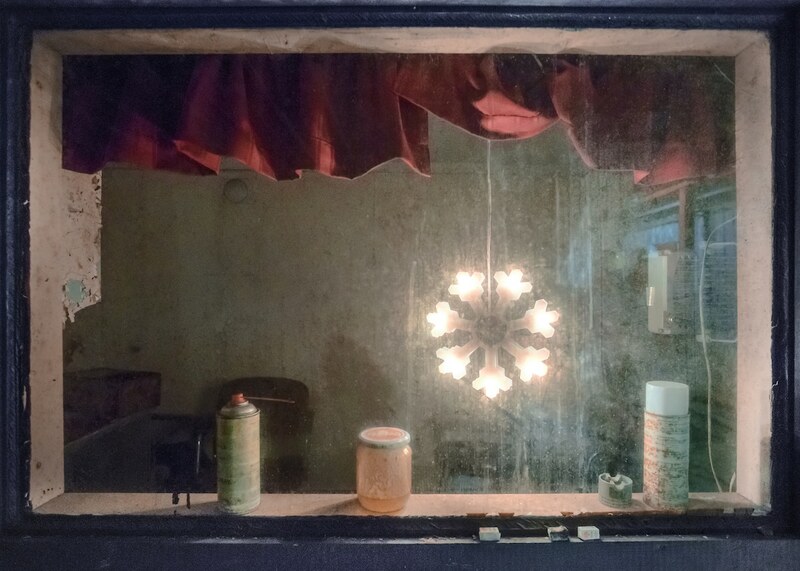 The doors were closed and all the equipment, clothing and even half-finished coffee cups were left to accumulate layers of dust for the next 20 years. My Modern Met granted permission to use photos by Maria Sahai.